Preheat the oven to 220C/ 425F. Heat oil over medium heat in a small ovenproof non-stick skillet. Add leek, onion and potato and lightly season with pepper. Cook until the leek and onion are soft and translucent, about 5 minutes. (It helps if leek, onion and potato are sliced very thinly.) Add zucchini and stir through. Add eggs and ricotta and stir to combine. Cook on medium for a further 2-3 minutes until the edges set and become firm. 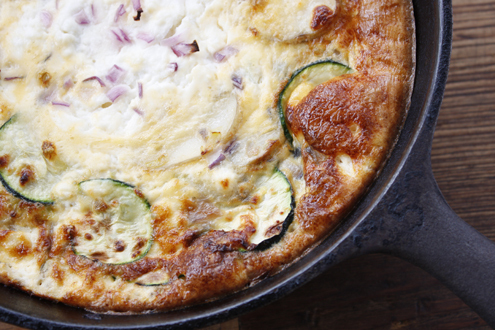 Transfer your skillet to the oven and bake until egg is cooked through and the top of the frittata is no longer liquid (approximately 10 – 15 minutes). If you don’t have a skillet use a frypan with a well-fitting lid. Instead of putting in the oven, continue to cook on low with lid on for around 10 minutes. The frittata will fluff up nicely. Make sure frittata is fully cooked through before flipping onto a plate, cutting into wedges and serving with toast and/or salad. Serving suggestion: It sounds way out, but leftover spaghetti or other pasta is great in a frittata and is an alternative to toast.